Today my sister brought by some library books which she had picked up for me. Included in them, Johnny Appleseed by Aliki. I know this book is scheduled for like, week 19 in Adventures, but we just started our unit on "A-a-Apple; If I stay in Jesus I will have much fruit," in MFWK. I was almost in TEARS reading this book! Not only do we learn about his love for apples, but his love of PEOPLE; and specifically his kindness toward the Native Americans. SO precious! I am sooo thankful for the literature which highlights that there were peace-loving Christians among the early settlers, not just greedy, murderous people. It would be so easy to be caught up in the "conquest" side of American history. Also, Friday, several of us from this area are headed to Windy Hill Apple Orchard in York, SC, for a field trip where "Johnny Appleseed" is one of the main characters - on hand to tell his story in person! Won't my kiddos be excited to meet him?! I just keep finding things in this year to be excited about!!! Have a great week in MFW! 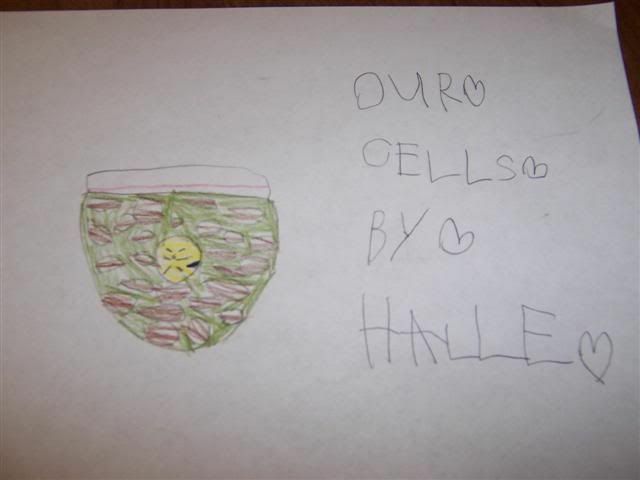 We recently did the plant cell project detailed in week 18 of ADV, and we had a BLAST! 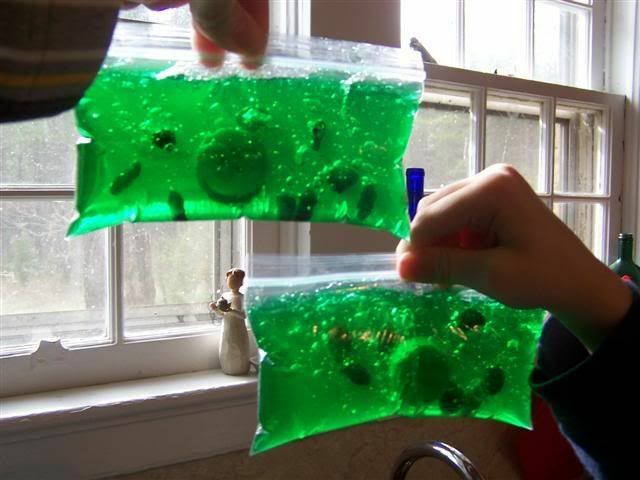 The activity calls for using jell-o inside a ziploc bag for the cell wall/membrane & cytoplasm, dried beans for organelles, and a grape for the nucleus. We modified the ingredients a bit, making it completely edible, and it turned out beautifully - not to mention, delicious! We used a slice of banana for the nucleus (more easily seen with our jell-o), raisins for the organelles, and lime jell-o to make our cytoplasm "chlorophyll-y!" I wanted to share an additional idea (even though your cells are probably eaten by now) that I had when we did this project. Once our jello was "set" in the ziploc baggie, I then put it into one of those small disposable clear plastice container boxes (I think they're called "Gladware") to demonstrate a plant cell with the cell wall. 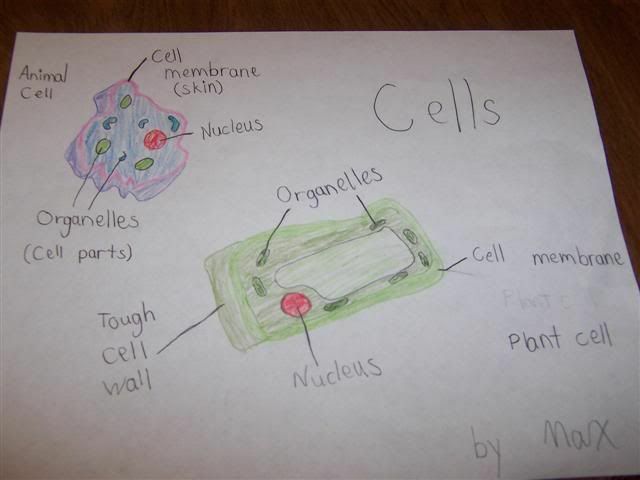 It just kind of made that concept of animal vs. plant cell concept more real to them. Then we took it out and ate it...lol. Paige, Looks like ya'll had a great time. I love your dc's drawings. ShariD wrote: I have been internet surfing for song history information to go with the Celebrate America CD songs. I can't find anything helpful for There Are Many Flags, and I've never heard of this song before. Does anyone have any info on the background? Thanks! Hmmm, I like a challenge. This song seems to be so old that the origins are a bit murky. The most consistent author I found cited was Mary H. Howliston. The title of the song ranged from "Our Own Red, White, and Blue" to "There Are Many Flags In Many Lands," and many others in between. ShariD wrote: Your research was more profitable than mine. I could only find sound recordings from CBD. At least I know a bit more and sometimes it's good for my little perfectionist to know that answers aren't always possible! This message board has also been so informative and helpful to me. It's even built up my confidence in my own abilities to homeschool. And I really appreciate the general and loving concern you all have for each other and for raising up children in a way that honors our Lord and Savior. Thanks to everyone for that. I do have a question about the science experiment for week 18--growing bacteria in milk. What exactly is supposed to happen? We put the milk in the jars a week ago tomorrow. One is in the refrigerator and the other is on the mantel. The milk in the later one has separated into a yellowy water and a white "block" that appears like cream cheese; and, of course, it soured and the kids think it's pretty stinky! Is anything else supposed to happen? I don't see any dark spots that I thought would appear as visible bacteria...is the bacteria there and it just can't be seen or should it sit for another week? It's so exciting to be a part of this with "adventure" with you and the other MFW'ers. So it sounds like you did the experiment correctly. The "proof" (at least for this stage and age of school) is that the milk soured and is stinky. So, this is a time where we could see some things, and smell other stuff. Something happened to that milk (bacteria grew faster) that didn't happen as quickly in the other jar (cold temps slow down the rate of growth of bacteria in the other jar). However, we can only see the effects of the bacteria (the milk separating and sour smell) and not see the bacteria itself. One of the things that we read in the First Enc. of Science is that bacteria are too small to see with our eyes. So you might want to read that again, check the quick links from the Usborne book. And you might even say how this connects to the recent recall of certain peanut butter products from the shelves --- due to bacteria growth even though it couldn't be seen. You could tell them that's why we put food and drink back into the fridge instead of leaving it out all night. And the importance of washing hands. Sounds like you did a fine job with the experiment. Time to toss it!!! We made our cotton with seeds using cotton balls and cut up construction paper. The children couldn't believe how hard it was to pick the seeds off and still have cotton left! We saved a bit of the our "cotton with seeds" and stapled it on their narration page. They were all very proud of it! I printed this coloring page of the cotton gin for ds to use on his Eli Whitney notebook page. He colored it, cut it out, and glued it on the top of his page. He also added a piece of his cotton w/ construction paper seeds. Authority...wanting to teach ADV boy more! Has anyone run across a resource about Authority that is suitable for a 2nd grade boy? Or do you have ideas or suggestions? I'm open! You might ask around homeschoolers in your area if anyone could lend you the book, "For Instruction In Righteousness." That's a thick book with Bible verses arranged topically, so you could back up your discussion with lots of Bible verses. BibleGateway also allows you to look up passages by topic. However, I think your search may be limited by the specific words you choose, rather than a more general topic? For little ones, I've always liked the amount of instruction in the MFW younger years. Most little ones don't really need a lot more explanation, since most will accept what they are taught as truth. They haven't yet reached the age of questioning the truth that their parents teach them So mostly it's a matter of remembering the lesson by repetition, and discussing how to apply it to the types of things that come up in their little lives? Re: Authority...wanting to teach ADV boy more! I think I would just discuss it with your child. I remember drawing a chain of authority for my kids. I drew them and then a line up to Mommy and them from Mommy to Daddy and then a line to God. That was their authority chain. Off the side of Mommy and Daddy I wrote thinks like, "The Law", government, Sunday School teachers, grandparents, boss. Basically, I wanted to show my kids that everyone has someone in authority over them. The ultimate authority is God and everyone has to answer to him. I used this opportunity to talk about how we all need to be in obedience to those authorities in our lives. When we do, we have blessings and are safe but when we step out of obedience bad consequences happen to everyone. God has placed an order of authority and it is our job to be obedient to that - even Mommy and Daddy. (My kids really like that part!) I then talked about how their job right now was to be obedient to Mommy and Daddy and had them memorize Eph 6:1 "Children, obey your parents in the Lord, for this is right." It's even easy to see right here that as children obey their parents, their parents need to be in authority to God. I don't have any resource particular to that issue but that's what I did! We used an umbrella as an example. God is the umbrella overall, next comes Daddy, then Mommy, then the littles under that. All protected, and under the authority of an umbrella. Oh, these are great ideas/resources. Thanks so much for your help! Drawing and labeling the umbrella picture will be great for a 2nd grader! I will save all the other info I have gathered in a folder for a later study of authority. For the Eli Whitney/cotton boll project, we glued flax seeds to the cotton ball - and boy did they stick! The kids had to work really hard to get them out. They were tired after one boll, so it was a great example of how hard it was to do this, especially for the slaves who had to do this work after a day in the fields! Mom to Sweet Girl 10, Jalapeno 8 & Pineapple 7.